« East-West Route : it’s Option A at Roseburn!! Manifestos are really important. They help you decide how to vote – and, for the 5 years after an election, you can use them to remind councillors of their promises. Perhaps the most important thing individuals can do, especially for ongoing influence, is join your preferred political party. As a member you have a chance to influence policies all year round, and particularly at election times. You don’t have to agree with every single policy and you don’t have to be an ‘activist.’ Many people belong to a party just to support it and to support the democratic process in general – but it also puts you closer to opportunities to influence policies. Don’t just criticise or leave it to others – play your part too!! And when elections come round you then also have the chance (if you want) to deliver leaflets, to help get your party elected and get their policies into action. Green – there is an online pre-manifesto survey. It closes soon, but when closed you can still email edinburgh@scottishgreens.org.uk. 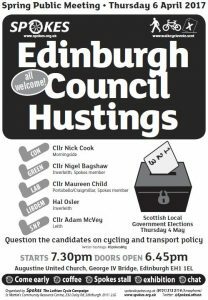 Transport and cycling are relevant to several of the questions. Labour – there is a downloadable online draft manifesto and feedback form. Transport including cycling is on page 5 of the draft manifesto. We are very pleased to see it includes maintaining the policy of 10% of the transport budget for cycling. SNP – consultation with SNP members has been completed. There is no formal consultation of the public, but members of the public can email ideas to their transport representative, Adam.McVey@edinburgh.gov.uk. Note: this email address is only for transport; for other topics you’ll need to find the relevant SNP spokesperson at the council. Spokes has already written to the parties – our letter is here. Rather than a long list, from which parties could pick and choose, we highlighted 3 top issues which we hope all parties will consider. a bike-friendly and pedestrian-friendly Princes Street. Click to download pdfUnfortunately we’ve not had time to contact parties in these 3 councils, but at previous council elections we discovered that in the smaller councils some or all the parties do not usually issue manifestos at Council elections, so voters have to rely only on leaflets distributed by the candidates. If readers are aware of parties developing local manifestos, please send us the contact details and we will gladly add them here. SNP – Cllr Adam McVey currently Deputy Leader of the Transport & Environment Committee, candidate for Leith. More details to follow nearer the time. Meantime put it in your 2017 diary – if you have one already!! We will be working closely with the all-Scotland campaign WalkCycleVote as the election approaches. As you can see, the 3 WCV ‘asks’ for the election are very similar to ours. WCV hopes to contact every council candidate before the election – a massive task!! and they will be looking for your feedback on the councillors in your own ward. Please spread this article by retweeting our tweet.